Flexible control unit with Digital Dial for monitoring operating status and displaying alarms. 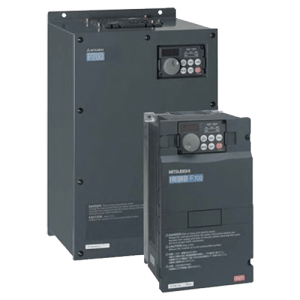 These inverters achieve massive power savings, particularly in the crucial low speed range and the braking and acceleration phases. For example, at a frequency of 35 Hz the inverter achieves a saving of 57 % over conventional solutions. Additional power savings of 10 % are achieved by Mitsubishi Electric’s innovative OEC (Optimum Excitation Control) technology, which ensures that the optimum flux is applied to the motor at all times. Savings for ventilation and extraction systems: Ventilation and air extraction systems generally require very powerful motors. The intelligent motor control functions of the FR-F740/746 series reduce starting currents and thus also the peak load power costs. Similarly, the system also cuts costs in low load operation. Maximum flexibility for pump systems: With their multi-motor function the FR-F740/746 inverters can autonomously integrate up to four motors in a pump system, using preset setpoint values. This highly-effective motor management is really useful in water supply systems requiring fast and flexible responses (e.g. for catering to sudden fluctuations in the demand for water).